Sunday April 27, 2014 - Today is another day to give thanks to Almighty God as we observe the 53rd anniversary of Sierra Leone's attainment of independence - political freedom that would allow us to take care of our own destiny. It has been a long hard road with unexpected twists, ironies and intertwined moments of joy, sorrow and sheer grief...but we plod on hoping that at the end of it all - all will be well for each and every one of us. It's another April 27 and time to celebrate the only country that we can truly call our very own - Sierra Leone - the land that we should love. We state should advisedly because we have seen quite a flurry of "land that we love" expressions which could well be a slogan that does not come from the heart. Indeed if we all claim to love the country called Sierra Leone, then we should be asking and looking for avenues of making the lot of the people who inhabit the land better for the land is not just the territory defined as Sierra Leone with international borders, but the people who inhabit it especially the majority who are treated as if they have no right to be within the borders of the country. If indeed you love the land called Sierra Leone as well as its peoples, then as from today start thinking and actually planning on how to lift them - from being the dregs of society to be used for political gains - on to a people who should be proud that they can still live life to the full in the country without the benefit of political connections. If indeed you love the land and the people of Sierra Leone, then as from today kindly put a stop to all the manipulations and shenanigans that see you and your ilk becoming rich at the expense of the poor - simply put, start becoming honest in all that you do and put the country and people first rather than personal bank accounts and wealth. If you start doing this as from today, then "Land that we love" becomes more than a slogan but something which means that you care for your neighbour and we don't mean the person next door but neighbour as explained in the pages of the Good Book, the Bible and the parable of the Good Samaritan. Allow us to take you through a little passage of history which should put into context the day we celebrate today. It just did not happen that we woke up one fine day on April 27 and wow there we have it - independence day. Not so by all means - it was a sequence of events that culminated into us becoming an independent state on April 27, 1961. We have just seen on the web, a record of Parliamentary Debates, called the Hansard in the United Kingdom - a name which we also have in Sierra Leone and where one can find a record of debates in Parliament. With the internet now so global, we hope those within the administration of Parliament, the Clerk of Parliament can set in motion the wheels that would allow Sierra Leoneans to read the record of debates in the Sierra Leone Parliament. This excerpt is from the 3.50pm debate on the Sierra Leone Independence Bill on 27th March 1961 in the House of Commons. 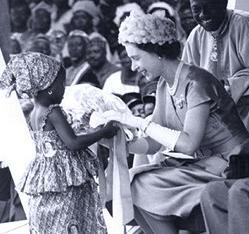 "It is nearly 200 years, as I have said, since we first went into Sierra Leone. One has some sorrow, in a sense, that an association of 200 years is coming to an end. But that sorrow is quickly replaced by happiness, because, after all, it is the end of a purpose which we set out to achieve—for Sierra Leone to be independent. I think the balance is on the side of pride and of thanks to all those who have made this achievement possible—to the missionaries, to the traders and to the civil servants. 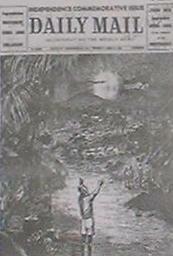 Generally it is invidious to pick out names, but I do want to mention the present Governor, Sir Maurice Dorman, and the great compliment that has been paid to him by the people and Government of Sierra Leone in that they have asked Her Majesty whether it will be possible for him to be the first Governor-General of Sierra Leone. But, as always, the real tribute is due to the people of Sierra Leone themselves, because if they were not as they are, and if they had not had the leaders they have, we should never have reached this stage. Above all, one recalls "the Doctor", as he is known to all the people of Sierra Leone—the Prime Minister, Sir Milton Margai. I remember well how I first had the occasion to meet him four years ago at the Independence celebrations for Ghana. Quite naturally, at that time we had a talk, and in some degree it turned to the prospects for his own country. I was very much struck not only by his moderation and his charm, but also by his wisdom, which had in it 28 a certain firmness of purpose. We have seen that firmness of purpose over the years as he has been leading his country to this end, which will be finally given effect to on April 27 next when Sierra Leone is to become independent. I feel that it is a country which will be well launched under his guidance and the guidance of others of his Cabinet. I beg to move." 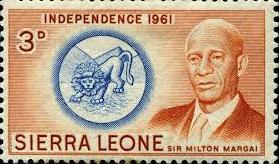 We would not bother you about the details of how Sierra Leone got to this stage in 1961 nor about why the government of Sir Milton thought it a wise move to have a group of people including one Siaka Stevens who were opposed to independence at that time, firmly locked up at Pademba Road until all celebrations were done in peace and harmony. Could this be the reason why Siaka Stevens tried to impose April 19 as the day to be celebrated instead of our true date of independence as he had declared Sierra Leone a republic on April 19, 1971? As we celebrate this day and renew our commitment to the land that we love - let us all resolve to put away all thieving, dishonesty, deceit, stealing from the public purse and all the practices that lead to disenchantment of the majority. We would urge you to read the whole text of the last independence day speech in 2007 delivered by the one and only Ahmad Tejan Kabbah, the man who, together with true and determined patriots brought the peace that we all now enjoy within the borders of Sierra Leone, never mind the fact that a chief operative of the destructive and murderous Revolutionary United Front, the RUF, one Omrie Golley has now been appointed Sierra Leone's envoy to some country. Yes indeed. It was this man who was on the international media, the BBC in particular who told the world that the RUF does not commit atrocities and that if any of their commanders are involved, would be brought to trial and punished!!!. Yes indeed. 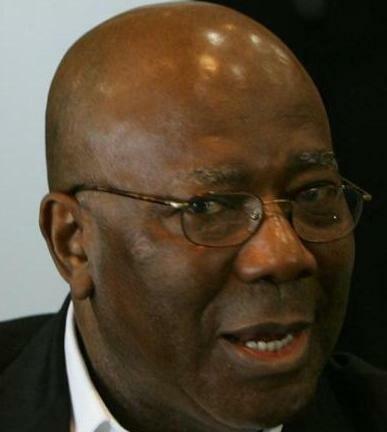 But back to a part of the late President Kabbah's speech in 2007 as the country prepared for General Elections. It is gratifying that we could all celebrate today in peace with the fervent hope that we shall never be troubled again by the suffering and destruction that was visited upon our country during the 11 years of rebel carnage...We have come a long way from those days of infamy and Sierra Leoneans should be proud that we were able to overcome our difficulties and to remain united as one nation even in the face of adversity...Today, our people feel free to go anywhere at any time of the day or night and everywhere in the country unmolested, something that cannot be said of many other countries in the world, including the developed world. Since the end of military rule in 1996, we have successfully conducted two Presidential and Parliamentary Elections and held local elections for 19 Local Government Councils as well as several Paramount Chieftaincy elections. Dear Compatriots, I cannot end this Independence Anniversary Message without sharing with you some ideas and thoughts which I had previously brought to your attention and which have been very close to my heart during my tenure as Head of State of our beloved country. This has to do with the need for core national values to guide our nation and to direct the actions of every Sierra Leonean irrespective of his status in life. I am still convinced that it is about time we begin to ask ourselves such questions as, who is a Sierra Leonean? What do we mean when we say, "let us do things the Sierra Leonean way?" What is the true Sierra Leonean spirit? How do we as a nation want others, especially non-Sierra Leoneans, to see us? If there were a concept or school of thought called "Sierra Leoneanism", what would be the main tenets of such a concept? I still call on all Sierra Leoneans to build on the above national values and to abhor the wanton destruction of life and property in the name of bringing about change. They should be industrious, discourage mediocrity, learn to demand the best and give of their best. They should believe that their peace, personal security and safety cannot always be guaranteed without the assistance and good will of those next door and the wider community of nations. Sierra Leoneans should be compassionate and be committed to sharing their talents and other resources with those in need. They should believe in fair play in the office, on the farm, in the school, in the sporting field and especially in politics. Politics as we should know is an offer to serve the interest of the people and not self-interest. Above all, Sierra Leoneans should once more believe in themselves and in their ability to get their country back on its feet. They should know that the primary responsibility for developing Sierra Leone lies squarely on the shoulders of Sierra Leoneans and that the best outsiders can ever do is to help them achieve this goal and not to do it for them. Our spirit should be one of determination, pride in perseverance and a will to succeed against all odds. We must succeed!! !